On January 27, 2017 Tony the Tiger® – Kellogg's® Cinnamon Frosted Flakes'™ biggest fan – stopped by Kellogg's NYC cereal café to surprise and delight customers in celebration of the new Cinnamon Frosted Flakes which is now widely available at stores across the country. This is Tony's first stop on his coast-to-coast road trip where he is traveling from New York to Chicago to Los Angeles to help unbox the delicious new flavor and encourage kids and adults everywhere to #LetYourGreatOut. 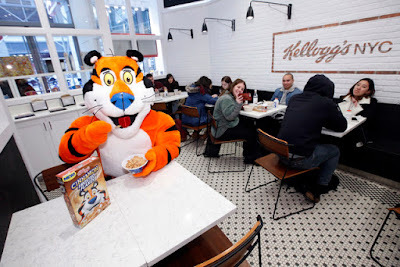 To keep up with Tony on his road trip, follow him on Twitter @RealTonyTiger as he shares the gr-r-reat news of Cinnamon Frosted Flakes across the country.